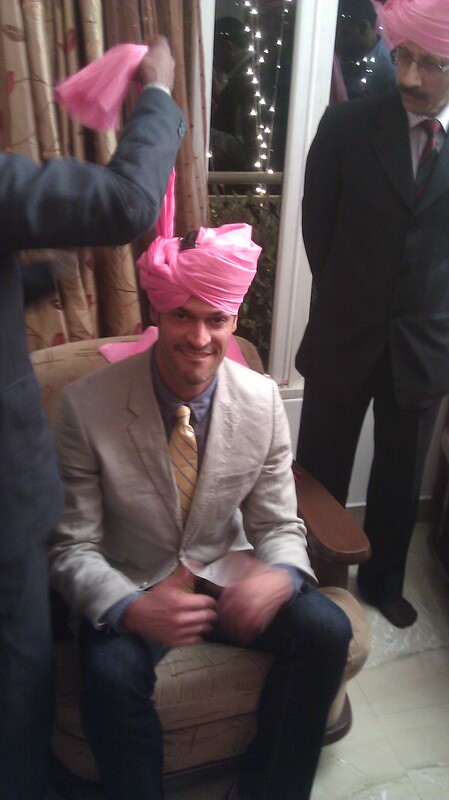 No… I did not marry an Indian girl… but I did have the great pleasure of being invited to attend my friends’ wedding in India. Now, unlike the wedding I went to in Ethiopia, I did not stumble into this randomly. I had a proper invitation and everything… preceded, of course, by a “I know you don’t know where you’ll be in December, but we’d like you to attend our wedding if you can… by the way, it’s in India.” I told them if I was anywhere nearby that I would definitely be there… and, well… as I was in East Africa in early December, I figured that wasn’t far enough away to prevent me from coming… with the attendance decision made, I was off to Delhi. A small bit of background to set the stage… the couple getting married are both English (one by birth, one by residency) and currently live in London. 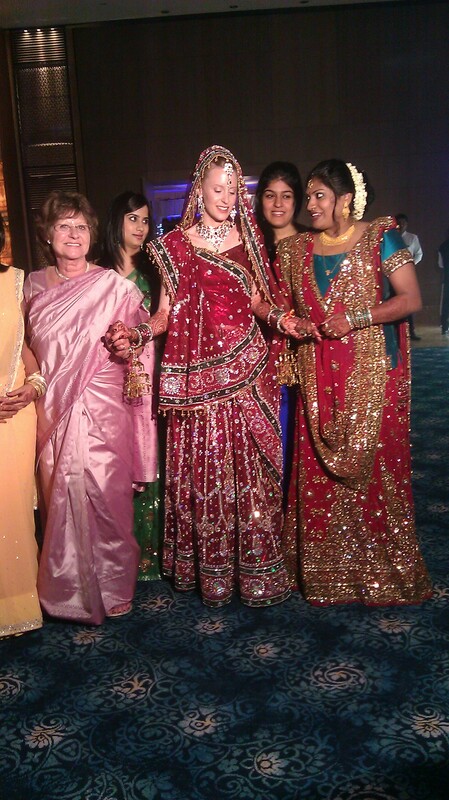 The bride is from England, while the groom was born in India, where his family still resides. I met them both at the same time (i.e. I met them as a couple, not as individuals) while visiting my friend Bob in New York. Bob became friends with the groom to be as they worked at the same company while Bob lived in London and Zurich. The lovely couple was out visiting New York (and Bob), and my visit overlapped with theirs. We must have hit it off alright as they agreed to hang out with me the next time I was in London (actually, in NYC, it was the future bride’s first time in America, and Bob and I kept forcing them to do “American” things… like eat fried chicken and waffles, and go to the batting cages, and drink giant cups of coffee, etc.). I saw them again around the following New Year’s Eve (12/31/11) as well as at my first international stop on this trip (I was in London for a week or so before I went to Spain). I can honestly say that I’ve never danced the night away like I have at their flat (just imagine about five people going nuts till the wee hours of the morning… to a pretty much an all Shakira playlist, fueled by gin, domino’s pizza and a view/balcony of the Thames)… and that has, much to my delight, happened on more than one occasion. Alrighty… enough of the fond reminiscing… that’s not what you people are reading this for are you? 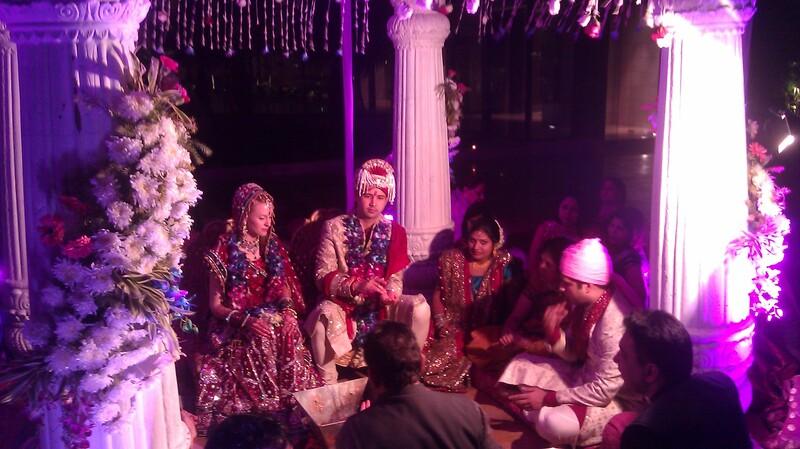 I thought as much… Now, traditional Hindu weddings are relatively long affairs compared to what I’m familiar with. They last for seven days, with the general trend of one ceremony/event a day, culminating with the actual marriage ceremony on the final day. Here’s the wikipedia page for those of you interested in more detail. In this case, since the bride is not Indian, there were only about half the events, as the bride’s side wasn’t doing some of the traditional ceremonies that an Indian bride’s family would be do (not because they didn’t want to participate, but because it just didn’t make sense). And… being a wedding and all… pretty much everyday turns into a huge party that goes on all night. And that’s where I come in… nice segue right… well, sort of anyways. One step back… my friend Bob (from the preceding paragraph) also came to the wedding (he probably won the award for traveling the farthest). The groom made the effort to ensure that Bob and I would be rooming together (in a guesthouse where all of the guests, at least the westerner guests, were staying), and the he took the extra step of notifying everybody else that Bob and I’s room was officially the “party room” (go ahead and do your best Indian English accent impression saying the words party room… it’s funny). Although, later, he did thank us for “volunteering” to be the party room… kinda like how my college football coaches would inform us that there were “voluntary” extra workouts that we may, or may not, be interested in attending… wink, wink. Okay… stage set. I arrived on a Tuesday morning after flying all night from Dar Es Salaam (6:30 PM flight from Dar, lands at 11:30 PM in Doha Qatar, 2 hour layover, then 3.5 hour flight to Delhi plus the time change got me to Delhi around 7 AM… I’m pretty sure everyone from Europe got there much faster than I did) and having this happen to me. After that ordeal and an hour taxi ride, I arrived at the guesthouse where all of the out-of-town guests were staying at about 10:30 AM. Luckily for me, this was the day that a trip to the Taj Mahal was organized… nearly everyone had a left on a bus for Agra that morning and would not be back until about 10 PM, so I spent the day napping and chilling (I say luckily because, even though I missed the Taj Mahal trip, I think I needed the rest). When everybody got back, they all pretty much ended up back in Bob and I’s room (the party room after all) having a couple of beers and chatting until about 2:30 AM when everyone turned in for the night (they were tired from the Taj Mahal trip)… I would not have thought it then, but 2:30 AM would turn out to be one of the earlier nights. The next day I got up and went on a tour of a factory that one of the uncles owned. We got back from the factory tour, cleaned up and headed out to the day’s wedding event… a dinner/celebration welcoming the bride into the groom’s family (in general, there was one wedding event every day in the afternoon or early evening). Post-event, everyone had some dinner and drinks, and then retired to the guesthouse for the after party (circa 10 PM). Bob and I, in an attempt to stave off disaster in our room, moved all our furniture (save the bed) out into the lobby area of the stairwell hoping that we could have the party out there so either one of us could sneak off and go to sleep if the thing got out of hand (our room was on the top floor of the guesthouse, which had a central stairwell and an fairly large… larger than our room anyhow, open, lobby-like area on each floor where the stairs switch-backed… and it was open air). This move worked seemingly well… a stereo was procured, drinks started flowing, the groom’s cousin was DJing from his computer and the uncles started to get everyone dancing. It seemed like our ploy had worked… at least until 1 AM or so, when we were told to get out of the lobby area as we were being too loud. And guess where everyone adjourned to? Correct… the party room, which was now (mostly) furniture free (meaning we now could cram way more people in there). The stereo, computer and DJ were put on the bed and everyone crammed in and really started to rock the place… and then it got sloppy… real sloppy. Drinks were spilled everywhere… for some reason, all of the beers, when warm (which these were… Kingfisher larges for those who wanted to know), explode like a shaken soda can when opened (they do not do this when cold as we found out subsequently), and since most people had had a few drinks, very few folks remembered to open them out on the balcony. On top of that, as part of the wedding event, all of the woman had been given the Indian equivalent of flower leis (you know, the hawaiian flower necklace dealios… the Hindi word escapes me), and somewhere in there, one of them decided it would be a good idea to begin tossing these into the rapidly moving ceiling fan… so, for an hour or so, there was sporadic orange flower showers inside. Somehow, the night finally started to die down circa 4:30 AM… and Bob and I had to spend a good couple of minutes clearing all the crap off our bed (including about 1,000 tiny orange flower pets) just to go to sleep. I’m sure you can imagine what we woke up to in the morning… it was not pretty… the whole room smelled like stale beer, half-drunk and empty bottles of both beer and rum were literally everywhere, and the floor was so sticky it was like walking on chewing gum. Not to mention, that through a combination of spilt alcohol, shoe soles and the ground up mush of tiny orange flowers, the floor was now the color of a skid mark. A sight to behold. Oh, and even more fun, the entire door handle assemblage (the lock, handle, opener and all) had been removed (through a combination of drunken assault and incompetent installation) so that now our bathroom door couldn’t be fully shut, or the user would be trapped inside (and this would not be fixed for the rest of our stay). So Bob and I did what most normal people would do… we got the hell outta there and did some sightseeing… we did tell the guys that our room needed to be cleaned… hoping that it would be finished by the time we got back (for afternoon naps and all). We leave around 11 and get back around 4, having to be somewhere around 6:30 (or ready to go by then… time being somewhat fungible in India). Of course, when we got back… very much looking forward to a nap mind you… the dudes hadn’t even started cleaning our room. We got them going only to have them take the entire 2.5 hours to finish… mostly because they were the most inefficient workers you have ever seen, but I digress. The floor was so bad they had to get one of those rotating floor polisher/cleaner machines from a neighboring guesthouse just to get the stains out. My favorite part occurred while Bob and I were out in the lobby down the hall from our room (sitting on the chairs from our room that we had brought, and left, out there the night before) and one of the guesthouse guys comes out, sits on the stairway opposite of us, points to the floor in the lobby (which was a little beat up from spills during the party before it moved into our room… but nowhere near as in as bad of shape as our room’s floor) shakes his head and asks us “what this?” Bob and I look at him, look at each other, and then back at him before telling him that we actually have no idea what those stains are made from (coke, beer, rum, flowers, all of the above…anyone’s guess really). The guy continued to shake his head, and then put it forward into his hands like he had given up on life… it was hilarious in hindsight (although during the moment I was to cranky to care as I really, really needed a nap). So, no nap, Bob and I cleaned up, and were the last folks on the bus on our way to the night’s event, which was the Mehndi. Do I need to even go into detail about what happened after the Mehndi..? No? You’d like to guess… okay… go… partying at the home where the Mehndi took place followed by more partying in the “party room” with everything finally dying down around 4 AM you say? Well… congratulations, you sir (or madam) are correct. Wash, rinse repeat for Friday night… except Friday night had an additional twist. You see, in a Hindu wedding, the giant party that we would normally have after the ceremony at the reception, is held the night before the actual wedding ceremony. So Friday night involved an actual nightclub (rented out for the wedding party, with a DJ that was really good… I wish I had gotten a couple of the Hindi songs he played), an open bar and a banquet afterwards… not to mention an after party in the party room (which, after an open bar earlier in the evening, got almost as sloppy as Wednesday night… Bob and I actually had to physically move out two of the uncles who had passed out on our bed). Luckily, we, as guests, didn’t have to be anywhere before about 5 PM the next day, so we could sleep in and relax a little bit… By Saturday morning I was truly knackered (thank you for this term British people) and I was beginning to doubt I’d survive another night like the previous three. The day of the actual wedding (Saturday) had arrived. The bride and groom had left previously to go get ready… the women were all gathered up at around 3 to go do whatever the women were supposed to go do at that point (I think it had something to do with putting on the sari’s with the help of the aunties). All of the men had to be ready to go at 5, at which point we’d be picked up by a bus, shuttled to Abhi’s Mom’s flat where we would get our turbans… yes… turbans. The men attending the wedding ceremony wear turbans… the color of which depends upon if you’re part of the bride’s side, or the groom’s side… in this case the family colors were pink for the groom and red for the bride. 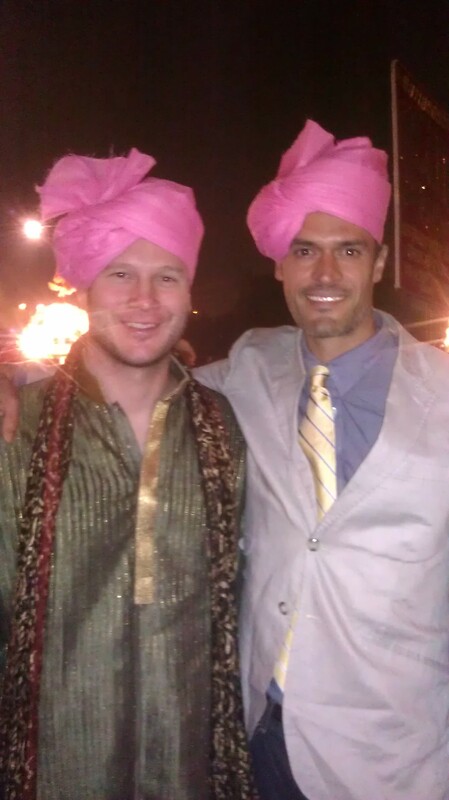 Since I had met the couple at the same time, there was a slight bit of deliberation on which side I was to be on… but it was determined that since I met the couple through my friend Bob, and Bob was friends with Abhi before he had met Amanda, that put me on Abhi’s side… so pink a pink turban for me. Traditionally, a procession of the groom’s side (including the groom, who gets to, actually has to, ride in on a white horse) leaves from his house and parades down the street to the marriage location, wherever that may be (the procession is, of course, accompanied by a band, music, singing and dancing… basically a giant street party with the groom riding a white horse the entire time). In this case, since the wedding was about an hour’s drive away, the procession left the house in full swing, went for a couple of blocks, where we then all got on buses (or in cars), were driven to near the hotel, where the groom was then remounted on the horse, and the procession marched the last couple blocks to the hotel (firework show included at this point). Now, the bride is supposed to meet the groom at the end of the procession… but, unfortunately, the bride’s driver got lost, and she didn’t make it in time to meet the procession… however, when she did finally get there… she made quite the entrance. Once they were both there, there was some meeting, greeting, cocktailing, snacking and picture taking for what seemed like an hour or two. After a bit, the bride groom and immediate family members retired to a gazebo-like structure that had been set up outside for the actual wedding ceremony itself. During the wedding ceremony, the bride, groom, and priest sat around a bowl containing fire under the gazebo, while the immediate family member sat on cushions around the gazebo (I’m sure there’s a proper term for this struxtre that is not gazebo… but I just don’t know it). What I found interesting is how relaxed the actual wedding ceremony is for the rest of the guests… who get to sit around, chatting, drinking chai (tea) and snacking all the while the ceremony is going on (I mean, I’m watching, but I’m also chatting with friends at the same time, as is everyone else not sitting with the families… very relaxed and informal). Post-official ceremony, everyone retires back into the banquet hall for some eating, more drinking and a little bit of dancing (thankfully, for me, not very much, as I was beat by this point). The last song of the night, at the request of either the bride or the groom (I’ll leave it to you, dear reader, to guess which one) was a Shakira song. That was it for the night… the bride and groom were off for one more post-wedding ceremony before leaving on a short honeymoon (to Goa) the following day… and all of us were shuttled back to the hotel for some much-needed sleep. 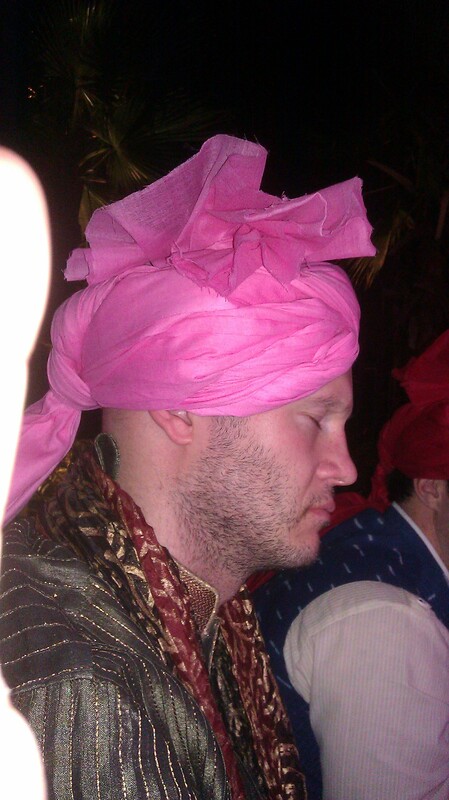 So that was my first Indian wedding… great fun, but really, really tiring. Luckily, I had this to look forward to get some rest. Not gonna lie. You look baller in that turban. Ha ha… Thanks, I felt pretty baller in it as well. Most entertaining!! Interesting! Thanks once again for the great adventure. Looking forward to the next journey…..